The hypothesis that water “treated” with intention can affect ice crystals formed from that water was pilot tested under double-blind conditions. A group of approximately 2,000 people in Tokyo focused positive intentions toward water samples located inside an electromagnetically shielded room in California. That group was unaware of similar water samples set aside in a different location as controls. Ice crystals formed from both sets of water samples were blindly identified and photographed by an analyst, and the resulting images were blindly assessed for aesthetic appeal by 100 independent judges. In conclusion, the present pilot results are consistent with a number of previous studies suggesting that intention may be able to influence the structure of water. Here is a photo of the effects direct states of conscious intention has on the structure of water. 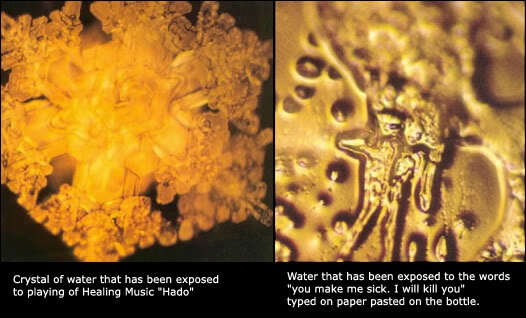 Dr. Masaru Emoto has been conducting groundbreaking research on the effect of thoughts/consciousness on water for a number of years. Water from clear mountain springs and streams had beautifully formed crystalline structures, while the crystals of polluted or stagnant water were deformed and distorted. 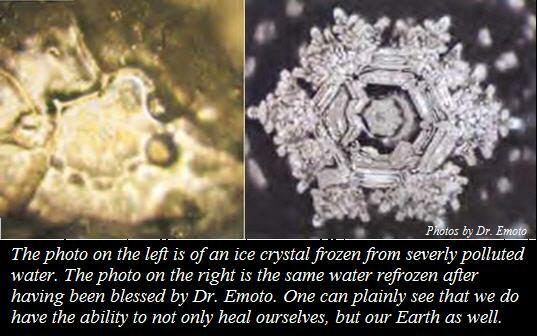 Distilled water exposed to classical music took delicate, symmetrical crystalline shapes. Whether you participate in global meditations, or simply do this inner work in the quiet of your own loving mind and heart, we can heal the body of our earth and recreate a clear, pristine world to hand down to our children for generations.